Pilot Automotive Electroluminescent Auxiliary Cable Pilot Automotive Electroluminescent Auxiliary Cable, Pilot Automotive EL-1301 Cable, Audio Auxiliary Cable, Auxiliary Charging Cable, Green Auxiliary Charging Cable, Pink Auxiliary Charge Cable, Blue Auxiliary Charge Cable, Orange Auxiliary Charge Cable [Pilot Automotive EL-1301 Cable] - $34.95 : 3rd Strike Performance, Your Source for Late Model MOPAR Performance Parts and Accessories! brighten up the interior of your ride while supplying your radio with tunes from your smartphone with a Electroluminescent Auxiliary Cable from Pilot Electronics. This great looking auxiliary cable is equipped with a micro USB charging port, control buttons, and microphone. The cord has a built in power source to keep your phone charged longer while adding style and flair. Each charge last up to 2.5 hours of non stop lighting fun. It measures 36" long and features standard 3.5mm audio jacks perfect for smart phones or tablets. 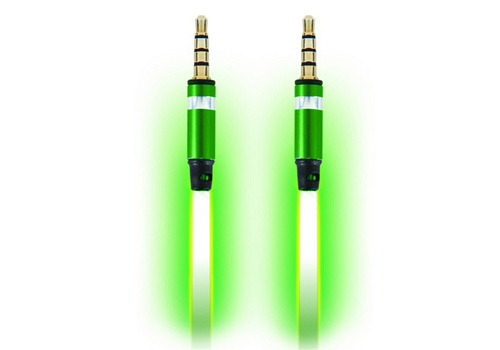 The best part about the Electroluminescent Cable is that it illuminates to the beat of your music. It's available in blue, green, pink, and orange to suite any owners style. Pick up your new Electroluminescent Auxiliary Cable today and show off your new style with bright lights.